Why did Pacific Rim do such gangbusters in China? Any theories? It would be understandable if Crimson Typhoon played a greater part in the story, but the primary purpose of the Chinese team was to show just how fucked up things were going to be for the real heroes of the piece. Yet, Pacific Rim has gone on to make $111,940,000 in China and had one of the biggest openings there in history. 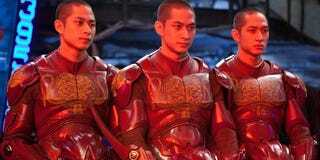 So, as the Chinese Army are quick in calling the film blatant American propaganda, why is it that you think the film is such a monster hit there?